The first English china porcelain was known as 'soft-paste'. Soft paste porcelain is the key to the china history of England as it is the direct predecessor of the loveliness that is fine bone china. You have to picture in your mind's eye, a bunch of Europeans in the 1700's desperately trying to emulate the hard, thin, transluscent, stunningly beautiful Chinese porcelain. The Germans got there first, but that didn't stop everyone else having a go. The French did their thing and did rather well. The English were very keen too. Then there was the utter quality of Copenhagen and the scintillating design quality of the other Scandinavians. The Dutch had given us Delft a long time before and the Spanish of course had the superb legacy of Buen Retiro, Capo Di Monte, Madrid. English soft-paste is made with china clay, but instead of china stone (feldspar) it uses other glassy substances to get the effect. It is fired at a lower temperature than hard porcelain, so is still porous unless glazed. Hard porcelain resists water. Eventually, someone (Tom Frye) thought of putting bone ash into the soft-paste mix. Spode of Staffordshire eventually put the right combination of both bone ash and china stone to the mix and, hey presto - bone china! Wow! What a material. Because it's almost 50% bone ash, which therefore replaces some of the china clay and china stone that European porcelain has, it is (rather snootily, I think) referred to as a 'soft-paste'. This is despite it being fired at the same high vitrifying temperature as hard-paste porcelain. It's less easily damaged than Euorpean porcelain and is fired at the same vitreous temperature, so why "soft-paste"? So, for me, English china is the ultimate porcelain - bone china is a purer white than European porcelain and harder. In general a better substance. Soft-paste English china was developed by Thomas Briand (Chelsea) and presented to the Royal Society in 1742 and is believed to have been based on a formula developed by Saint-Cloud in France. In 1749, Thomas Frye, a painter, took out a patent on a porcelain containing bone ash. This was the first recorded use of bone in bone china history, but the recipe still needed a lot of work as it wasn't the perfect mix. The recipe was subsequently perfected by Josiah Spode (Jnr), unquestionably the most pre-eminent figure in bone china history. Spode, sadly went into administration in 2008. The old factory is now a ruin. Some business entreprenuer, I am sure must have bought the brand and may be continuing, but it's not the same, is it? Such is the current fate of English china. I am doing my best to raise the phoenix from the ashes with my ongoing company making English bone china figurines. But there are no longer many of us left flying the flag. It is generally stated that the only British hard-paste ( true ) porcelain is that made by Plymouth and it`s successor factories - Bristol and then New Hall. This is true up to a point but it should be remembered that Coalport used a quite thickly potted, hybrid hard-paste porcelain from it`s establishment in the 1790s until around 1814 when the factory started to use a noticeably softer, `warmer` body and glaze and sometimes more thinly potted body. From c.1820 items made from this body frequently bear one of the Society of Arts Gold Medal `Feldspar` marks. 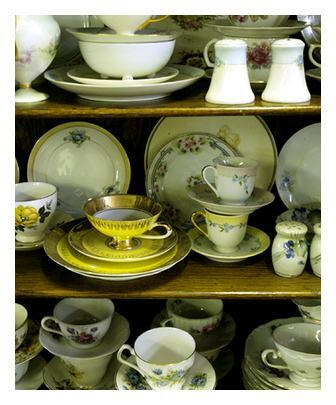 Another oft repeated comment is that Josiah Spode `invented` bone china. Not so. Spode developed and refined bone china into what became the standard British body but bone china was first used at Bow in 1748 - some 41 years before Josiah Spode started tinkering. On a happier note, it means that right now there are some terrific English china bargains to be had on eBay. As the fashions and tastes swing back to a vintage look and to what some people call 'Shabby Chic', the English china look is becoming more and more in vogue. This will inevitably lead back to an upsurge in prices for English china, so best bag your bargains now, before it turns. Recipes were closely guarded, as illustrated by the story of Robert Brown, a founding partner in the Lowestoft factory, who is said to have hidden in a barrel in Bow to observe the mixing of their porcelain secrets. A partner in Longton Hall referred to "the Art, Secret or Mystery" of porcelain. All the above were experimentiong with soft-paste. In the mix too were Caughley (Salopian), Coalport, Davenport, Liverpool, and Worcester - all pioneers of early English china porcelain. In 1744, the Bow factory was originated when a porcelain patent using clay from America was taken out by Heylyn and Frye. By 1747, together with two London merchants, they had founded the Bow factory. Manufacturing Oriental style porcelain for the new middle-class market, by the mid-1800's, Bow was England's largest porcelain factory. Bow's subsequent decline was precipitated by the deaths of three partners and a reluctance for the successors to adapt to new fashions. The factory was sold in 1774. Around 1744 two partners, Sprimont & Gouyn teamed up with a Meissen chemist and began making a porcelain with frit (powdered glass) ingredients in Chelsea, London. In 1749, the factory expanded in size and productivity, looking to follow the aristocratic market of Meissen and the Japanese and Vincennes designs. In 1769, Sprimont sold the business and various owners operated it until 1784. 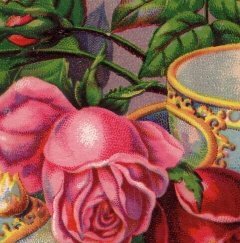 By 1750, the Derby China Works had been established by china-maker Andrew Planché (1728-1805), a Huguenot and apprentice goldsmith. In 1756, William Duesbury (1725-86), an enamel-painter, and John Heath, Planché's financier, formed a partnership and the factory expanded. In 1774, a showroom was opened in Covent Garden, London. In 1776, they purchased the Bow factory. William junior (1763-96) succeeded his father in 1786 and enlarged the factory. Subsequent owners could not keep up with the times and the factory folded in 1848. Around 1749, following a bad start at Chelsea, Charles Gouyn left his partnership with Nicholas Sprimont. He went on to sell porcelain wares at St. James's, near Hyde Park Corner. The body of his wares contained a glassy frit similar to the techniques and recipes of French soft-paste porcelain. The difference was it had a high lead content from the flint glass. The wares sadly often collapsed during firing. Formerly known as the "Girl-in-a-swing" factory the works produced scent bottles, figures and "toys". 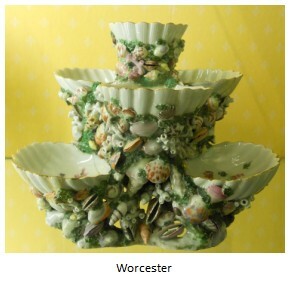 The Worcester Porcelain English china factory was started in 1751. A group of investors, including Dr. John Wall whose genius it was that has made Royal Worcester the oldest surviving and and most renowned in the history of bone china. In 1752, the factory aquired the Bristol China factory and began to make a soft-paste porcelain based upon soap stone. Worcester specialized in china tea tableware, which had to withstand boiling water without cracking (the soapstone was the secret to this technology). Worcester also decorated with transfer-printed designs. Following the death of Dr. Wall, and an economic recession, the works was so well set up by its founder that it weathered every storm to survive until this latest economic crisis, which put pay to the old Worcester works for good. Even more early English china soft-paste porcelain factories include Limehouse and Vauxhall, and West Pans, Badderley-Littler, and Pinxton. Some English factories were making hard-paste porcelain such as Plymouth, Bristol and New Hall. Hard paste had long been the territory of the Chinese makers, eventually being emulated by Meissen of Germany in 1910 (see Meissen and Dresden listings in my China Manufacturers guide . Hard-paste porcelain has to be fired at a higher temperature than soft paste (1400 Celsius against 1200 for soft paste). Hard-paste porcelain can be fired to make porcelain bisque (unglazed), a very hard porcelain. It is a bright, white porcelain which is impermeable to water. WILLIAM ALSAGER ADDERLEY (& Co) : Longton, 1876-1905, earthenware and English china, Adderley Ltd from 1906. SAMUEL ALCOCK & Co : Cobridge, 1828-53, Burslem, 1830-59, earthenware, English china, parian, etc. , subsequently Sir James Duke & Nephews. CHARLES ALLERTON & Sons : Longton, 1859-1942, earthenware and English china, lustre decoration, etc. CHARLES AMISON (& Co Ltd), Longton, 1889-1962, porcelains, formerly Amison & Lawson, c.1878. ANSTICE, HORTON & ROSE, Coalport, 1800-14 : local competitor of the adjacent factory of John Rose. The third partner, Thomas Rose is John's brother. G. L. ASHWORTH & Bros. (Ltd) : Hanley, 1862-1968, earthenware, ironstone, etc., continues, as Mason’s China Ltd, from 1968. JOHN AYNSLEY & Sons (Ltd) : Longton, since 1864, porcelains. BATES, BROWN-WESTHEAD & MOORE : Cauldon Place, Hanley, 1859-61, earthenware and porcelain, formerly J. Ridgway, Bates & Co, subsequently, Brown-Westhead, Moore & Co.
J. & M. P. BELL & Co (Ltd) : Glasgow, Scotland, 1842-1928, earthenware, parian, English china, etc. BELLEEK POTTERY : Fermanagh, Ireland, since 1863, parian, porcelain, etc. BOOTH : Tunstall, with several different names (Thomas Booth & Co, BOOTH Limited, Booths & Colcloughs Ltd), 1868-1954, earthenware, and from 1948 bone china. BOW CHINA WORKS : London, c.1747-c.1776, porcelain, mainly soft-paste. Bow was very popular in England in 18th century. One of the most successful uses of enamel colours on Bow wares is seen on those pieces decorated in one of the well-known Japanese Kakiemon styles. Perhaps because of their lack of highly skilled painters they succeed in recapturing the seemingly free manner of painting seen on the oriental wares, as opposed to the more painstaking copies on some Continental and English porcelains. BRISTOL PORCELAIN : Bristol, c.1750-52 et 1770-81, porcelain (hard-paste during 1778-81 period). BROWN-WESTHEAD, MOORE & CO : Cauldon Place, Hanley, 1862-1904, earthenwares and porcelains, formerly Bates, Brown-Westhead, Moore and subsequently Cauldon Ltd.
CAUGHLEY (OR SALOPIAN) WORKS : near to Broseley, 1775-99, porcelain. Thomas Turner, founder of the Caughley works, had formerly been employed at the Worcester porcelain manufacture, which techniques he used in his own factory. 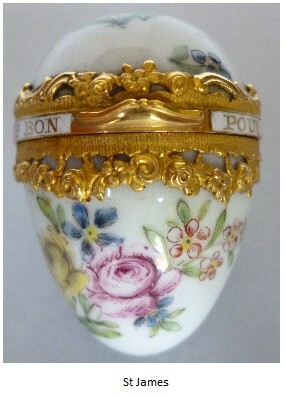 Sold to John Rose & Co (Coalport). CAULDON Ltd : Cauldon Place, Hanley, 1905-20, formerly Brown-Westhead, Moore & Co, subsequently Cauldon Potteries Ltd.
CAULDON POTTERIES LTD : Stoke, 1920-62, English china and earthenware, formerly, Cauldon Ltd.
CHAMBERLAIN(S) (& CO) : Worcester, c. 1786-1852, porcelains, subsequently Kerr & Binns. One of the main rivals for Worcester porcelain manufactory where Robert Chamberlain was an apprentice. Business was obviously so good that they opened a London shop in 1813. This thriving situation continued until 1840, when they were merged with Flight, Barr & Barr, under the name of Chamberlain & Co. Eventualy Chamberlain works were taken over by Kerr & Binns. 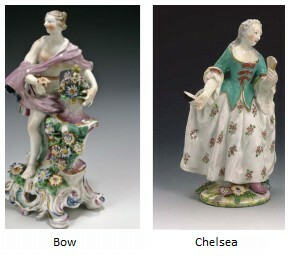 CHELSEA PORCELAIN WORKS : London, c. 1745-69, porcelain (soft-paste). 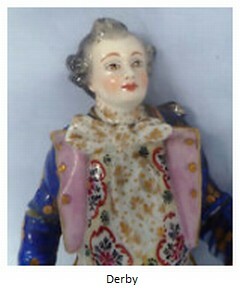 One of the most popular 18th century English porcelain manufacture. Chelsea’s fine quality of work was praised with its sophisticated silverware shapes (Nicholas Sprimont, a Belgian silversmith founded the manufacture). Quality was the master card as Chelsea porcelain was showing very little originality in style, owing a great deal to the earlier exports from both China and Japan and the baroque fashions of Meissen, changing to the new rococo style popularised by Sèvres. Sold to William Duesbury, from Derby manufacture, in 1769. 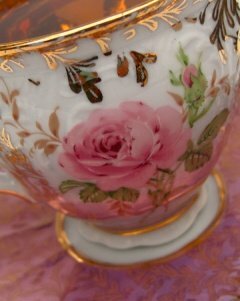 COALPORT PORCELAIN WORKS (John Rose & Co) : Coalport, since 1795, (in Stoke-on-Trent from 1926), porcelain. High quality production, specialised in tableware (dinner, tea and dessert services). The manufacture flourished with rococo style revival. COLLINGWOOD BROS. (LTD) : Longton, 1887-1957, china. SUSIE COOPER CHINA LTD : Longton, 1950-59, Burslem from de 1959-61, Bone China. SUSIE COOPER O.B.E. : Burslem, from 1930, earthenware and English china. W. T. COPELAND (& CO LTD) : Stoke, from 1847, porcelain, parian and earthenware, formerly Copeland & Garret. COPELAND & GARRET : Stoke, 1833-47, porcelain, earthenware and parian, etc., formerly Spode, subsequently W. T. Copeland. CROWN STAFFORDSHIRE PORCELAIN CO. LTD : Fenton, since 1889, English china. HENRY & RICHARD DANIEL : Stoke, 1822-36, ‘Fine quality porcelain and pottery’. DAVENPORT : (several differing names : W. Davenport & Co, Davenports Ltd, etc. ), Longport, 1793-1887, earthenware, creamware, ironstone, porcelain, etc. DERBY PORCELAIN WORKS (W. Duesbury, Bloor, Royal Crown Porcelain Co) : Derby, c. 1750-1848 and from 1878, porcelain. William Duesbury period (enamel painter in London) - from 1750 to about 1820From 1769 to 1775, William Duesbury was working the Chelsea factory in London and then at Derby. This period is known as the Chelsea-Derby period. The old works were closed in 1848. DOULTON & CO (LTD) (known as Royal Doulton) : Burslem, since 1882, earthenware and china.Royal Doulton became a very strong group in 20th century. They took over MINTON in 1968. SIR JAMES DUKE & NEPHEWS : Burslem, 1860-63, porcelain, parian, etc., formerly Samuel Alcock & Co, subsequently Hill Pottery Co. Ltd (definitely closed in 1867). ALFRED FENTON & SONS : Hanley, 1887-1901, earthenware and English china. FORD (T. & C. Ford, Thomas Ford, Charles Ford) : Hanley, 1854-1904, porcelain. Taken over by J. A. Robinson & Sons Ltd in 1904. GEORGES GRAINGER (& Co) : Worcester, c. 1839-1902, porcelain, parian, semi-porcelain, formerly Grainger, Lee & Co (1812-39). HAMMERSLEY & CO : Longton, 1887-1932, china, formerly Harvey Adams. HERCULANEUM POTTERY (Messrs Worthington, Humble & Holland, and other owners) : Liverpool, c. 1793-1841, earthenwares and porcelains. HICKS & MEIGH : Shelton, 1806-22, earthenware, ironstone, formerly Baddeleys, subsequently Hicks, Meigh & Johnson (definitely closed in 1835). HILDITCH & SON : Lane End, 1822-30, earthenware and English china. GEORGES JONES (& Sons Ltd) : Trent Pottery (c.1864-1907), Crescent Pottery (c. 1907-57), Stoke, earthenware, majolica, etc., and from 1872, English china. LOWESTOFT PORCELAIN FACTORY : Lowestoft, c.1757-99, porcelain (soft-paste and bone china). MASON : several differing names from 1792 to 1848Miles Mason, Islington Pottery, Liverpool (c.1792-1800)), and Victoria Pottery (c.1800-06), and Minerva Works, Lane Delph (c. 1806-16), porcelain. C.J. Mason & Co, Lane Delph, 1845-48, ironstone and earthenware. MINTON : Stoke, 1793, porcelain, earthenware, parian, majolica. Minton was sold to Royal Doulton group in 1968, but it is still working with its identity. NANTGRAW CHINA WORKS : Nantgraw, Wales, c.1813-14 et 1817-22, porcelain (a fine translucent body). NAUTILUS PORCELAIN CO : Glasgow, Scotland, 1896-1913, porcelain, parian, etc. NEW HALL PORCELAIN WORKS : Hanley, 1781-1835, porcelain (soft-paste and bone china). PARAGON CHINA (CO) LTD : Longton, from 1920, porcelain, formerly Star China Company. SAMUEL RADFORD (Ltd) : Longton and then Fenton, 1879-1957, English china. John Ridgway, Bates & Co, 1856-58, earthenwares and English china. Subsequently, Bates, Brown-Westhead, Moore & Co.
ROCKINGHAM WORKS : near to Swinton, Yorkshire, c.1745-1842, earthenwares and from 1826, porcelains. Thomas C. Wild & Sons (Ltd), from 1917. SHELLEY POTTERIES LTD : Longton, from 1925, English china, formerly Wileman & Co (1892-25). JOSIAH SPODE : Stoke-on-Trent, c. 1784-1833, earthenware, porcelain, stone-china, subsequently Copeland & Garret. Spode pottery manufacture flourished beyond all expectation in Stoke, helped by the retail shop they had established in London to market their wares. Prior to the end of the 18th century the factory was producing nearly every type of ceramic ware common to Staffordshire at that time, with the exception of porcelain. It is accepted that Josiah Spode II invented bone ash porcelain around 1796. By comparison with some contemporary wares, Spode’s services and decorative wares might well be considered heavily decorated, with their bright enamel colours and burnishing gilding. William Copeland, a former member of the staff, took over the manufacture in 1833. STAR CHINA CO : Longton, 1900-19, English china, subsequently PARAGON. SWANSEA PORCELAIN : Swansea, Wales, 1814-22, porcelain. JOHN TURNER : Longton, c. 1762-1806, earthenware; creamware, Wedgwood type (jasperwares…) and rarely porcelain. JOSIAH WEDGWOOD (& SONS LTD) : Burslem, from c.1759, Etruria, from c.1769, and Barlaston from 1940, earthenwares, basaltes, jaspers, porcelains, parian, majolica, etc. Wedgwood remains well known for its universally recognised blue and white jasperwares. Since 1759 Wedgwood was producing every type of ceramics except porcelain that was introduced in 1812. One of the most famous English manufactures.